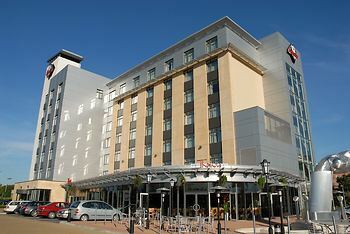 Hotel Future Inns Cardiff Bay, Cardiff, United Kingdom - Lowest Rate Guaranteed! With a stay at Future Inns Cardiff Bay in Cardiff (Butetown), you'll be steps from Cardiff Bay and 7 minutes by foot from Wales Millennium Centre. This 4-star hotel is 1.4 mi (2.3 km) from Cardiff Motorpoint Arena and 1.9 mi (3 km) from Principality Stadium. Price, facilities, parking, wifi, customer service. Location good for access by car but not so good on foot. How convenient it was to the event I was attending at the Millennium Centre and how friendly it has been on previous stays. Location was good and hotel was easy to find. Our room was a good size. The room was too hot. A power cut occurred on one morning which meant that guests,myself and husband included, were not able to use the bathroom as it was dark and no running water.Due to the power cut there was no breakfast for some guests myself and husband included - surely there was a stock of food items for a continental breakfast but nothing was offered once the cooked items and toast had gone. I know the loss of power was not the hotel's fault but I do think that provision should have been made re breakfast. Location was perfect, staff pleasant and helpful.